To give you a flavour of the weekend, read the stories participants want to tell! 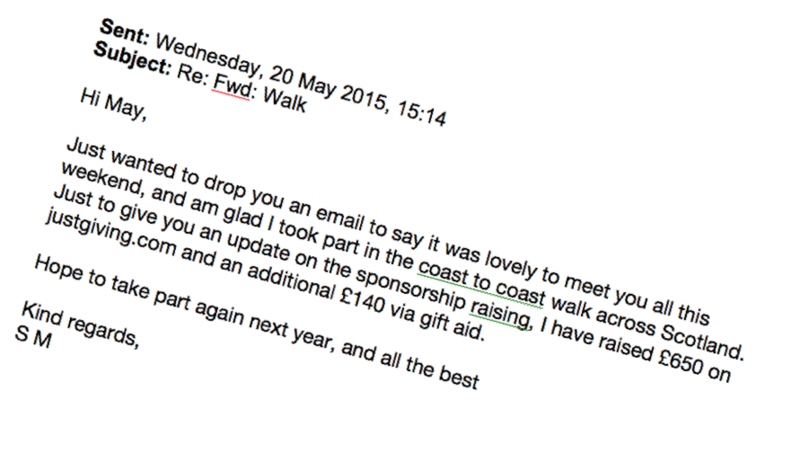 Thank you for your phone call on Monday and this email today enquiring after my health. The healing I've ben told will be slow but sure. I'm still in a lot of pain and limited to what I can do, but hey ho I'm breathing!! and here to tell the story of a wonderful weekend. Just need to take it easy and not move too quickly, also to take the painkillers. Gutted at the injury sustained from such a slow and low fall. He’d done many a short walk with me. He’d done the Macmillan Speyside Challenge with me. 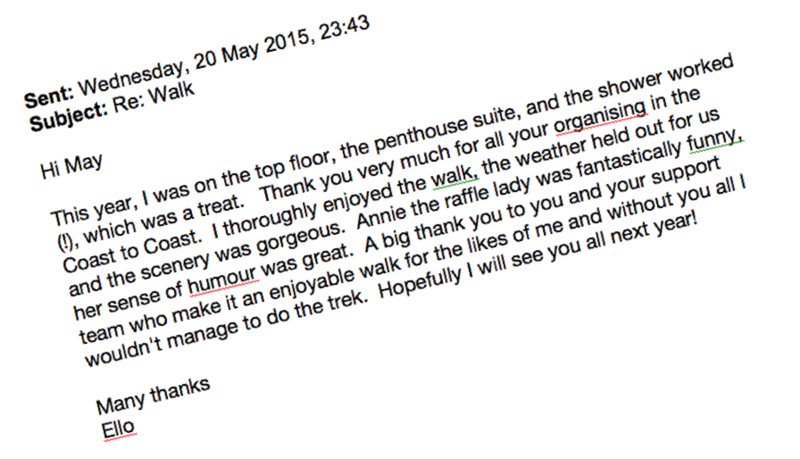 He’d done the Six Harbours walk with me and he and I had climbed Ben Nevis together. Now it was time for the “Big One”, the Macmillan Ullapool to Bonar Bridge walk. and his night's stopover in Ullapool. The second day he ate a very hearty breakfast in the morning and was happy to get going. Although the weather was somewhat inclement, with heavy and wintry showers he plodded along beside me quietly. “He” is my ten-year-old Grandson Ellis, he did very well and I am very, very proud of him. If he can do it so can you. He had been on several walks with me. He had done the Macmillan Spey side walk with me. 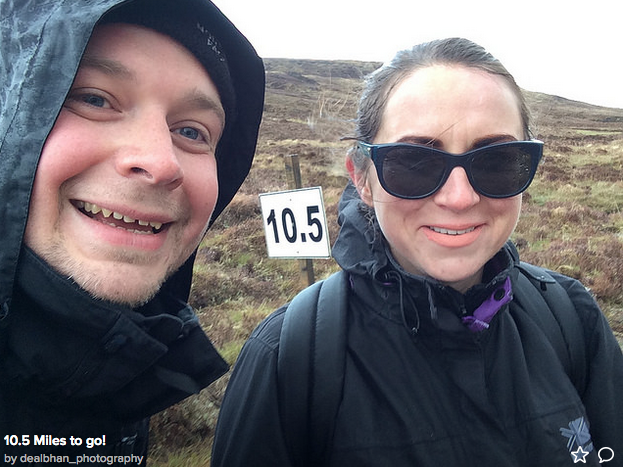 He had done the six harbour walk and climbed Ben Nevis with me – and now it was time for the big one. The 36 mile Ullapool to Bonar Bridge. The first day he managed without any problem. On the 2nd day he enjoyed a hearty breakfast and set off for the longer walk of 22 miles. he walked without any problems. He managed to finish and after a drink, he got on the bus and fell asleep. "He" is my Grandad and he is 65, I am very, very proud of him. It was a brilliant weekend! Bonar Bridge on Saturday morning threatened rain. 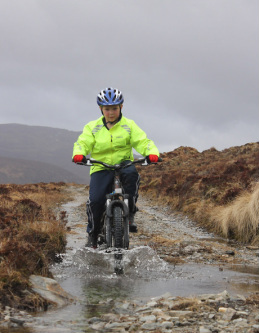 Should I be silly and cycle the road route to Ullapool? Given how unfit I was it was an easy decision to go for a relaxed cycle and cover the route from Croik church. Basking in sunshine I took it easy up the slight hill in Ardgay. My heart went into an arrhythmia. Hmmm. My long standing heart condition could be a problem over the weekend. If it played up on the Sunday I would just need to go slowly and if needed take all day. Slowly I addressed my fears for tomorrow and relaxed. For today I could just take my time, enjoy being out. The trees were just beginning to leaf. The stump from a felled birch was flowing with sap, something it really should have done a month ago. Following the road on the south side of the Carron to its end I stopped for a chat with a local shepherd, spending half an hour putting the world to rights. Then it was time to change the saddles, check that horses, and all the equipment were sound and safe. Not knowing any better, I asked a very friendly bystander if he would mind holding onto 'a horse'. He smiled, hesitated slightly, and then stretched out his hand. I was going easy on him, and initially only gave him two horses to hold onto. But as all seemed well, I soon handed over the other two as well. His smile got bigger and bigger, as he told his friend: "This is the first time in my life that I have anything to do with horses who do not bite, or kick me." Well done! And thank you for being willing to help with all four of them. That must have taken some guts! I expect you have been inundated with messages, but this is just to say all the Stevens'- family thoroughly enjoyed the Bonar Bridge to Ullapool. It is a unique event you have created. Each time I do it, I can't help but be impressed by the organisation that must go into it, and how helpful and friendly all your helpers are. Young Lewis thoroughly enjoyed the whole experience and did not seem the least put off by the weather. He is determined to do it again next year - so do I, if still fit enough. I won't forget to send in my sponsorship money. Despite the fact that this was my eighteenth time on our great Trek, I faced an unexpected challenge. 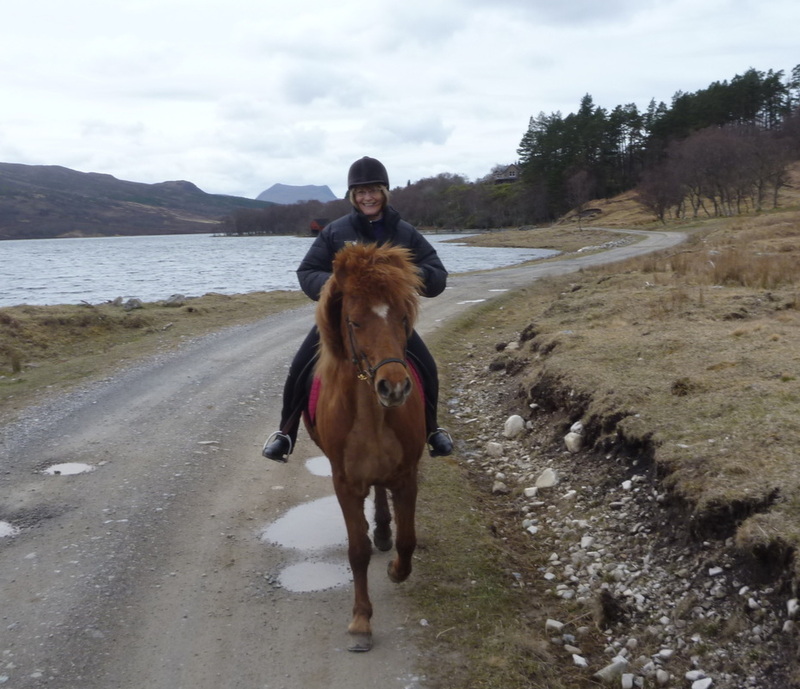 It came from Gundula who very kindly invited me to ride in from Ullapool to the pasture on Kella, one of her horses. Gundula and Jeremy had brought four, 2, plus 2 spare, in case the ridden pony tired. At first I was hesitant as I have only ridden my Highland pony Bonnie since I got her in 2001, so to suddenly climb on to a horse, I have not met before, let alone ridden, felt pretty daunting. I’m delighted to say I accepted that challenge and thoroughly enjoyed the ride, though we probably did the distance in half the time than had I ridden Bonnie! Icelandic ponies have a gait called “tölt “which is something altogether different – and this tölt I thoroughly enjoyed! I won’t tell you how I “felt” on the trot!! Thank you Gundula for introducing me to your lovely horses, and allowing me this exciting experience.! To Be... - or not to be Paul? As in previous years, Paul was the vet in attendance of the 2013 coast to coast event. So about 5 miles into our ride on Saturday, we met this very polite cyclist and his lovely black labrador - who were both just in time to open a gate for us. We thanked him politely and were ready to move on, when May called out: "Is that you Paul? I only recognized the dog!" And indeed - much to our amusement - this turned out to be Paul, having just cycled over from Bonar Bridge. Sunday morning in the dining room, we surveyed people eating their breakfast. Some friendly faces, some who we had chatted to the previous evening, some we had noticed in passing - but Paul did not seem to be amongst them... 15 mins later, and we are on our way to the car, who should appear with his bike - but Paul & his dog. I instantly realised that I had indeed spotted him in the dining room, and not recognised him either. - So Paul, if you want to be seen, make sure you are in the company of your dog!